The Sixty-eighth United States Congress was a meeting of the legislative branch of the United States federal government, consisting of the United States Senate and the United States House of Representatives. It met in Washington, D.C. from March 4, 1923, to March 4, 1925, during the last months of Warren G. Harding's presidency, and the first years of the administration of his successor, Calvin Coolidge. The apportionment of seats in the House of Representatives was based on the Thirteenth Decennial Census of the United States in 1910. Both chambers had a Republican majority. 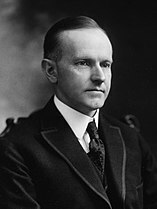 President: Calvin Coolidge (R), until August 3, 1923; vacant thereafter. Senators were elected every two years, with one-third beginning new six-year terms with each Congress. Preceding the names in the list below are Senate class numbers, which indicate the cycle of their election. 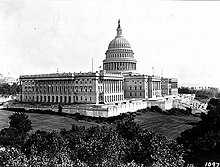 In this Congress, Class 1 meant their term began in this Congress, requiring re-election in 1928; Class 2 meant their term ended with this Congress, requiring re-election in 1924; and Class 3 meant their term began in the last Congress, requiring re-election in 1926. The names of members of the House of Representatives elected statewide on the general ticket or otherwise at-large, are preceded by their district numbers. (2) Joseph M. McCormick (R) Died February 25, 1925. ^ "Four amendments that almost made it into the constitution". Constitution Daily. Philadelphia: The National Constitution Center. March 23, 2014. Retrieved March 3, 2017. ^ "A chronological list of senators since the First Congress in 1789" (PDF). United States Senate. Official Congressional Directory for the 68th Congress, 1st Session. Official Congressional Directory for the 68th Congress, 1st Session (1st Revision). Official Congressional Directory for the 68th Congress, 1st Session (2nd Revision). Official Congressional Directory for the 68th Congress, 2nd Session. Official Congressional Directory for the 68th Congress, 2nd Session (Revision).